Throughout the season, the Rookie Report Card has covered some of the biggest rookies and not only looked at their performance to date – but also their long term upside. 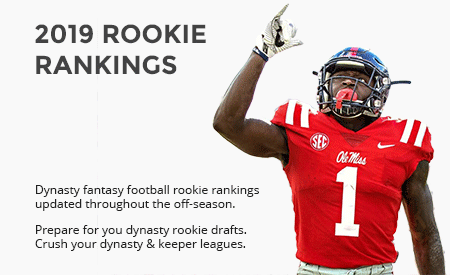 Now that the regular season has wrapped up and fantasy owners are looking towards the future, we have an opportunity to take one last look at the 2015 season and assess the rookies – A final report card if you will. I already covered the quarterbacks so let’s move on. We covered 25 rookies throughout the season, including nine running backs. Let’s put a bow on the season by taking one more look at those signal callers’ first shot running the ball on Sundays, as well as a quick glimpse into their futures in part two of the Final Rookie Report Card – Running Backs. It would depend strictly on team construction for me. If I was primed for a championship run and looking for a solid veteran, I would shoot for a guy like Jordy Nelson, Brandon Marshall or at the least, Eric Decker or Emmanuel Sanders. If I wanted youth and upside, I would try to get a guy like Doral Green-Beckham even if it meant adding a draft pick or another player to get it done. Great article Dan. I need a little wr help. Would you move Ameer Abdullah for Kevin White? I’m a little worried about K. White being a one hit wonder in college plus he is coming off a year long injury playing on a not so good Bears team. I have the same concerns with White but that value is simply too good to pass up. In a vacuum, I always try to take the upside of a wide receiver over a running back as well so that’s a slam dunk. Although I see Abdullah as a good trade target this offseason, take White and hope he begins to realize his massive potential starting early in 2016. No Buck Allen, Ajayi, Coleman? Allen started for much of the season when Forsett went down. Ajayi was originally the #3 RB until possible knee issues came up at combine time cause a drop till the 2nd round in rookie drafts. Coleman was a first rounder in rookie drafts that started for Atlanta till he got injured. Be nice to have a report card for these guys too. They were all in part one.